Donegal will take on Munster champions Cork in the All-Ireland SFC quarter-finals after seeing off Fermanagh by 0-11 to 0-08 in today's qualifier in Enniskillen. In a dour encounter that failed to catch fire, Donegal struck eight second half points, including two from newcomer Leon Thompson, to end Fermanagh’s fight. Two points from Eamon Maguire, whose day lasted only 30 minutes due to concussion, helped wind-backed Fermanagh go in at the interval 0-05 to 0-03 ahead. But Donegal rose to the challenge in the second half – substitutes Adrian Sweeney, Colin Kelly and Stephen McHugh grabbed a point apiece to book a return to Croke Park for their side next Saturday. Tír Chonaill boss Brian McIver was forced to reshuffle his pack before the throw-in with full-back Paddy Campbell suspended and both midfielder Brendan Boyle and star forward Michael Doherty failing late fitness tests. James Gallagher came in at left corner forward to take over the free-taking duties, while Naomh Conall duo Anthony and Leon Thompson were promoted to the line-up and the 21-year-old Tommy Donoghue took Campbell’s place. A free-ridden first half – referee Eugene Murtagh awarded 15 frees in the opening 18 minutes – began well for Fermanagh with Maguire setting up Sean Doherty for a second-minute opener. Donegal's short-passing game saw their skipper Christy Toye put into space for a neat reply but the influential Maguire, taking a Marty McGrath offload, swept over Fermanagh's second soon after. With little in the way of goalmouth action – only Leon Thompson's drive at Chris Breen in the 22nd-minute was noteworthy – the game was struggling to come to life, and it was not helped when a heavy shoulder charge from Ciaran Bonner on an unsighted Maguire resulted in a lengthy injury stoppage. The St Pat's attacker took a knock to his head when being felled by Bonner on 29 minutes. With oxygen on board, he thankfully regained consciousness before being taken to hospital. A curling free from Gallagher had levelled the game at 0-02 apiece, and the same player got away from Barry Owens before sweeping over his only point from play on the quarter-hour. Donegal's play took a nosedive for the remainder of the half as their reworked full-forward line of Rory Kavanagh, Leon Thompson and Gallagher saw little ball. Too much lateral running from the Ulster finalists saw them fall to score with Gallagher and Kelly responsible for three successive wides in injury-time. 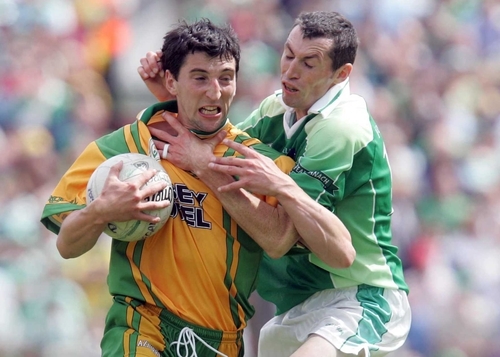 By that time, the hosts were 0-05 to 0-03 clear thanks to points from Maguire, who benefited from a stunning leap and flicked pass from McGrath, Ciaran O’Reilly (free) and Murphy, who intercepted and shot over on the run. Former All-Star Sweeney, brought on for Gallagher at the break, registered Donegal's fourth wide on the trot and seventh in all, just moments into the second half. But as rain began to tipple down on Brewster Park, McIver's men noticeably upped their game. Thompson, at just 21, sent over a sweet strike from the left wing for his first point. Fermanagh 'keeper Breen was then called upon to save at the feet of Rory Kavanagh before Toye levelled the sides for the fourth time (0-05 apiece) with 30 minutes remaining. The strangely quiet Tom Brewster landed his first free in the 44th-minute to nudge the Ernesiders back in front, but for the last time. A pinpoint ball in from Toye picked out Thompson and the 5ft 8in youngster grew in stature as his right-footed effort bisected the posts. Kavanagh and Sweeney (free) added to Donegal's total as they hit three on the bounce to move 0-08 to 0-06 in front. Fermanagh, who threw on Damien Kelly and Fearghus Reilly in an attempt to liven up their attack, could only scrap for possession as their scores dried up. The ever-ready McGrath willed his men on with another point on the run, reducing the margin to one. But there was more conviction at the other end – points from Michael Hegarty and substitutes Kelly and McHugh swamped a sole free from Brewster as Donegal deservedly scrapped their way into the last-eight. Fermanagh: C Breen; R McCluskey, B Owens, S Goan; S McDermott, H Brady, R Johnston; M McGrath (capt) (0-01), M Murphy (0-01); M Little, T Brewster (0-02 (2f)), E Maguire (0-02); A Little, S Doherty (0-01), C O’Reilly (0-01 (1f)). Donegal: P Durcan; N McGee, T Donoghue, K Lacey; E McGee, B Monaghan, B Dunnion; N Gallagher, A Thompson; C Toye (capt) (0-02), M Hegarty (0-01), C Bonner; R Kavanagh (0-01), L Thompson (0-02), J Gallagher (0-02 (1f)).